Have you suffered from dry, itchy, and red eyes after spending a long day at work staring at your computer screen? That is mainly due to the blue light coming from the LCD and LED screens, which also promotes wakefulness and affects our natural sleep cycle. Given most of our lifestyles today, it is nearly impossible being away from a screen, which is why having the best blue light blocking glasses is a must. Here, we are going to talk about our top three favorite blue light blocking glasses in hopes to help you find the one that would work best for you and your needs. Almost everyone agrees that exposing our eyes to a computer screen for long periods is a genuine health concern. It contributes to our ill health as well as increases the risks for chronic illness. Hence, we decided to try out multiple blue light blocking glasses on the market and then narrowed it down to the top three that we are certain will be beneficial to you. We do an in-depth review of each of them to help you make a more informed decision. So, let’s dive right in. 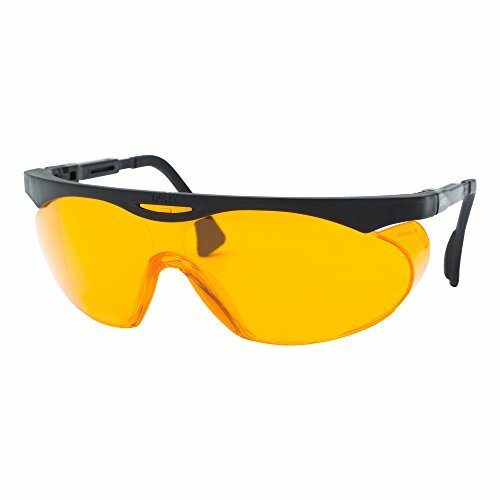 The Gamma Ray Optics’ Blue Light Computer Glasses is an excellent product to protect your eyes from the computer screen. Why? Let us look at its features to find out the reasons why. For starters, this pair of glasses has a plastic frame along with a plastic lens that is non-polarized. The lens is about two inches in width, while the width of the glasses is about 5.47 inches. The height is 1.62 inches, and the stick is 5.51 inches long. The gap between the lenses is 0.62 inches. The pair is available only in color black. In terms of its look, this pair of computer glasses is simply fantastic. They suit almost every face type and has a very classic design. You won’t have to worry about being out of style when you wear these. Furthermore, the frame and lens are FDA-approved, and it meets all the requirements set by the EU, ANSI, and ISO. The glasses have a TR90 nylon frame and flexible temple arms. It weighs just 22 grams, which not only makes it ultra-lightweight but also makes it very durable and comfortable. This pair of glasses is perfect for long-term use. 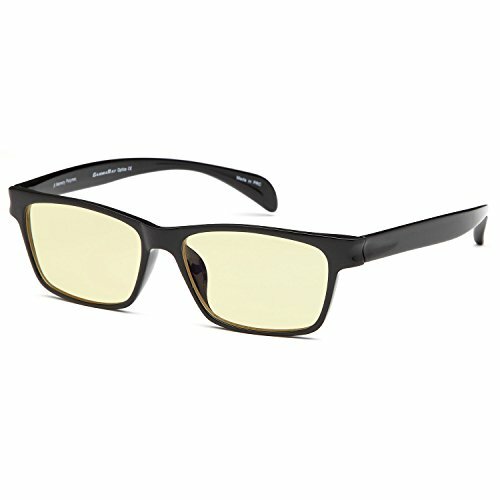 These computer glasses have an amber tinted lens, which will greatly minimize eye strain that is caused by the blue light emitted from the screens. Aside from that, it will alleviate the discomfort and the visual fatigue that is caused by spending hours looking at the screen too. All of these benefits are the result of the grave reduction and UV400 protection features. This means that the product greatly benefits professional gamers as well. The Eyekepper Glasses is the perfect choice if you are looking for multiple options when it comes to color and type. The pair is available in various sizes starting from +0.00 to +4.00, and it comes in 17 different lenses and stick colors. However, there are other features that make this pair stand out. As for its overall size, it has spring hinges and a height of 1.5 inches. The spring hinges frame is approved by the FDA, and it also meets all requirements set by EU, ISO, and ANSI. The width of the frame, on the other hand, is a little more than five inches. The pair is perfect for anyone who has a head size ranging from medium to wide. The look and design of this pair of glasses are very similar to the previous one in that it also boasts a classic and stylish look. With the many choices of colors available, you can buy multiple of them to make it match your outfit for the day. What we particularly liked about this pair is that the lenses come with five layers of protection. These include an anti-scratch, anti-static, blue-light filter, UV400 protection, and radiation protection layer. All these layers ensure to reduce the fatigue and relieve visual discomfort when you work on a screen for long periods. The pair also has an anti-fog feature. You get one hard zip EVA case along with a soft cleaning cloth with this pair of glasses. The Uvex Computer Glasses is quite different from the previous two we have reviewed because this pair comes with an orange lens that features a special spectrum control technology. This tech is capable of absorbing up to 98% of blue light from both LCD and LED screens. Not convinced yet? Check out more of its features! This pair of glasses does a fantastic job in preventing cataracts and macular degeneration. The lens is easily detachable too, which allows for quick and easy replacement. This makes it very economical. This pair is glasses is slightly larger and heavier than the previous two as well. Its dimensions are 2.7 by 7 x 2.2 inches, and it weighs about 45 grams. These U.S.A-made glasses are available in packs of one, two or ten glasses. What we liked about this pair of glasses is that it comes with adjustable length Duroflex temples that allow for a more comfortable and custom fit. Furthermore, the temple tips are cushioned to avoid digging into the side of your head, and there is a molded nose bridge that easily and comfortably rests on the face. Another feature we liked, in particular, is the multi-angle viewing. There is a three-position lens inclination system. This allows for an optimal screen viewing in different positions and heights. This is perfect as it will prevent neck strain if you are working standing, sitting, or even stretched out. Having any one of these best blue light blocking glasses in your arsenal will help you alleviate visual discomfort and fatigue easily. Each of these glasses offers ample protection from the harmful blue light and are perfect to use for long periods of time. 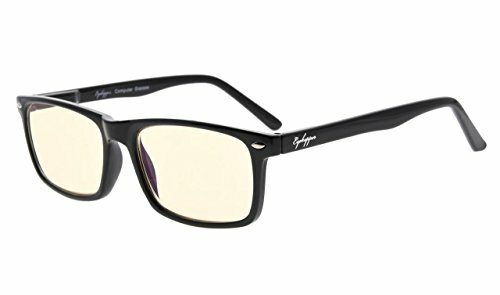 Of the three computer glasses, we personally prefer the features of the Uvex Skyper Blue Light Blocking Computer Glasses. While they may not be the most flattering when it comes to appearance, they have the highest percentage of blocking out the blue light.